_MAL3384.jpg, originally uploaded by Michael A. Lowry. 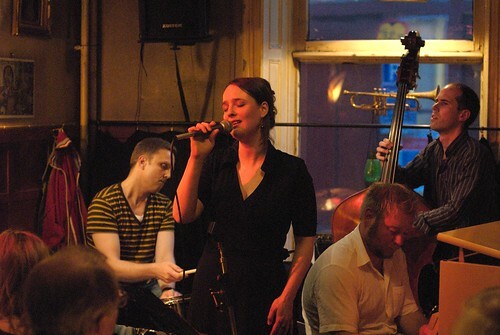 Monday night Rebecca from Uppsala came down to Stockholm to join me for a bit of jazz at Glenn Miller Café. The band was the Jennings/Lindström Projekt. Jeanette Lindström had a bit of trouble with her voice due to laryngitis, but oddly enough, it seemed to get better with each song. In other jazz news, I learned from Lotta that Steely Dan will be performing at the Stockholm Jazz Fest this summer. They'll perform on 17 July on the big stage on Skeppsholmen. I went to the jazz fest back in 2004 with Lotta and Lisa and we had a great time. The last (and only) time I heard Steely Dan in concert was way back in 2001 when they performed at the Globe here in Stockholm. I'm looking forward to hearing them live again!